Trying to continue my line of minifig SW vehicles: A really quick MOC that I made while waiting for an order to ship in. It was a little constrained piecewise, seeing as I only had a limited amount of dk. red parts, but I like how it turned out, sleek and simple. And just for my man Don, I built some landing gear. Special thanks to my big white friend EMPEROR (Andrew Allan Ascanio) for the pic editing. This one's nice I like the smoothness of it. Awesome design and use of SNOT! 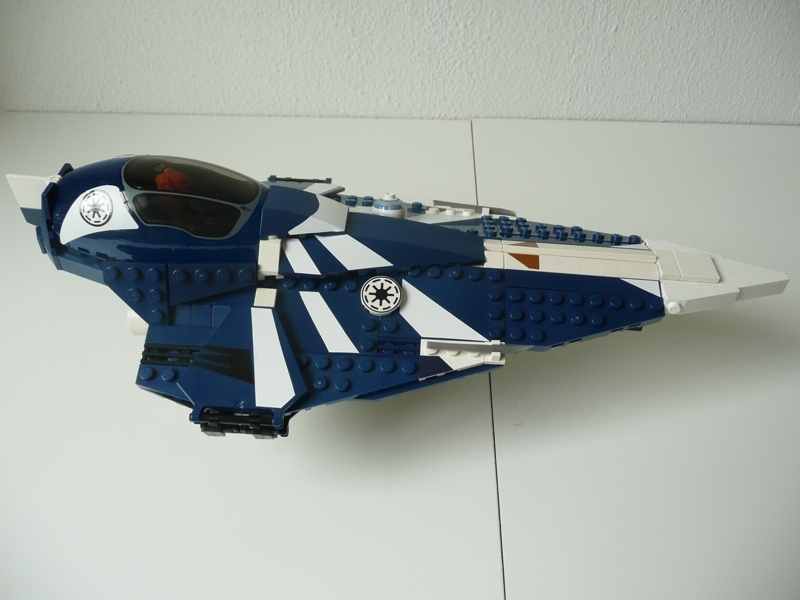 Thats the best Jedi starfighter I've seen so far. For a second it looked like it wasn't built of bricks. Good job Junsier. Great job! I've never seen so much SNOT in a jedi starfighter before. Fantastic. Detailed but simple. Good Job! You should curve the wings a little bit. Save that, perfect! It is very sleek and smooth looking, which is very cool. My only problem is it's abit plain in my opinion. Could use some more details on it. That was my thought, too. Maybe it'd look better if you used the printed slope peices from the official starfighter set. Nice pointy nose. 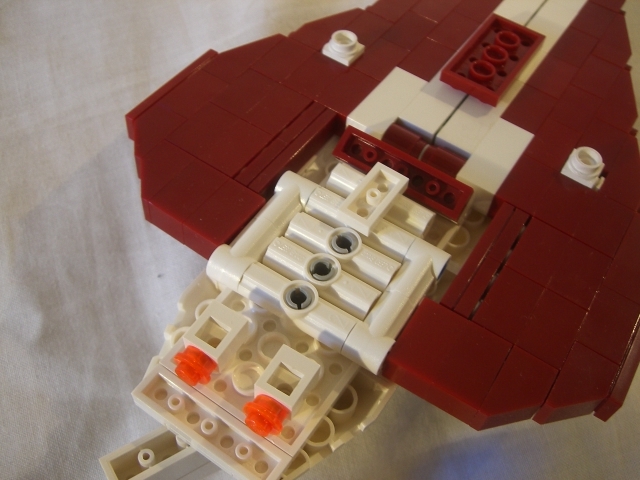 The Lego versions of this starfighter bug me. You did a good job at capturing the shape. Thanks for all the nice comments everyone. I'm sure the printed slopes would look a lot better here, I just never bought most of the prequel trilogy sets, so I don't have a lot of them. Certainly a nice shape, and I love the dark red slopes. I wonder about the underside though, there needs to be a couple of nice big engines and a bit more body work in the middle I think. The Jedi Fighter is a tough one, this is a good start. 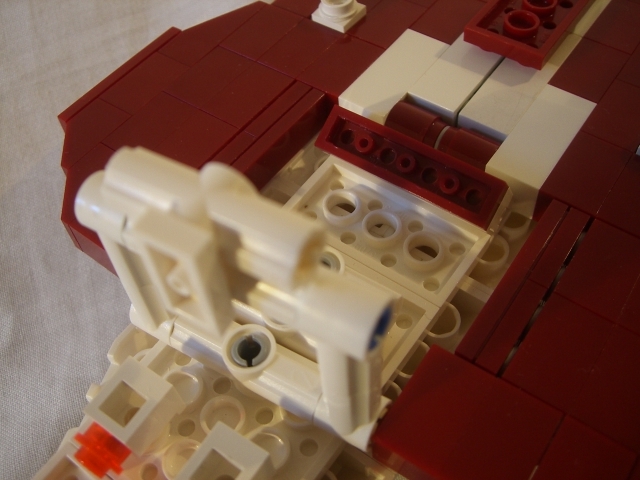 For me DutchRebel's Plo Koon Starfighter is the best minifig scale one i've seen DutchRebel's Jedi Starfighter. I reckon there's a masterpiece of a Jedi Starfighter waiting to be built by someone in full studless glory, UCS scale I reckon. I suggest hinging at the centre, or from the body to give the wings an angle. Using inverted 2x3? upside down slopes ( upside down sloping pillar thingy ) could also eliminate the studs on the wing sides and still give the desired shape. I tried that but didn't have enough of the things to make two wings, then my kid destroyed it and i gave up. The newer larger cockpit fits better in my opinion. For a quick MOC this still pretty cool though. For a "quick" build this is indeed a very nice jsf. I think it could use some greebles, but that would detract from the snotty look. Also I'm not sure about the tail fin, but that could be just me. Still a great rendition. Wow that's amazing. Good job juniper. So smooth and brilliant.I love it. A good example of what can be done with the good old slope piece. In times where shape is more and more realized by large prefabricated pieces. Very nice!